STRATFORD—Angela Grindrod’s left arm was making a statement. It was her bat that added the exclamation point. The Stratford High junior pitcher fired her first career no-hitter, a six-inning gem in which she faced the minimum number of possible batters, and also had a three-run home run to lead the Red Devils to a 13-0 win over arch-rival Bunnell on Thursday afternoon. It was the third straight win to open the season for Stratford. The Red Devils also posted its third straight win over Bunnell after losing 11 straight to the Bulldogs dating back to May 22, 2007. With a 1-0 lead, Grindrod walked Bunnell’s Ymoni Ortiz, but the Red Devils quickly retired her when a fortuitous bounce on a passed ball allowed catcher Riley Matto to gun the ball to second base quickly. From there on, Grindrod was all but untouchable. She struck out the side in the second and fifth innings and fanned two more each in the third and fourth. No balls reached the outfield off of Bunnell’s bats. In the meantime, Stratford was giving Grindrod a lead to work with, scoring single runs in the first four innings to take a 4-0 lead. Taylor Lubas reached on an error and later scored on another miscue in the first; Hayden Smith walked in the second and crossed home on a wild pitch; Rachel Newall reached on an error in the third and scored on Gatto’s RBI groundout; and, in the fourth, Melissa Uhrynowski reached on an error and later scored on Abby Smith’s RBI single. The Red Devils started to blow the game open in the fifth. Matto led off with her second double of the game before Grindrod reached on an error and pinch-hitter Bella DeLorenzo singled. Matto (2-for-4, 2 doubles, 2 runs scored) scored on a throwing error while Uhrynowski had an RBI single and Smith grounded into an RBI out to push the lead to 7-0. In the sixth, a six-spot by Stratford put the finishing touches on the win. 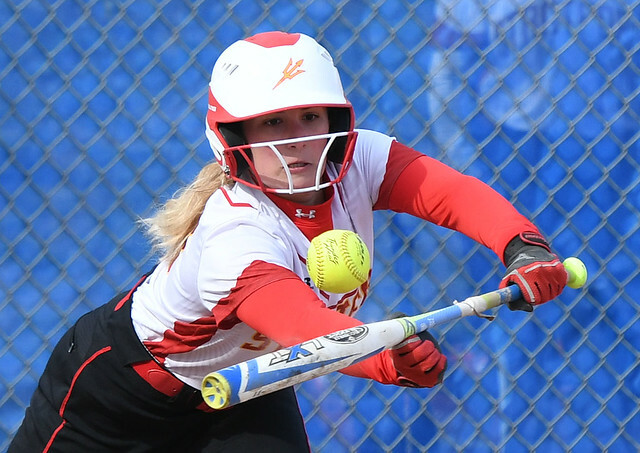 Lubas got the ball rolling with a lead-off single, but it was Grindrod’s three-run blast to right center field that was the big blow for the Red Devils. Pinch-hitter Christiana Carrillo delivered another RBI with a base hit and Lubas (3-for-5, 2 runs scored, 2 RBIs) capped the scoring with a two-run single for Stratford. For Bunnell, a rough day in the field proved costly as the Bulldogs made eight errors in the game. Quiricone admitted a big reason for his team’s offensive woes on Wednesday was Grindrod’s left arm. Bunnell pitcher Mikayla Bonilla, a freshman, struck out five in defeat. Batteries: S–Angela Grindrod and Riley Matto; B—Mikayla Bonilla and Ymoni Ortiz.